The weight-driven, three-train eight-day movement is constructed between plates and has anchor escapement with seconds pendulum. 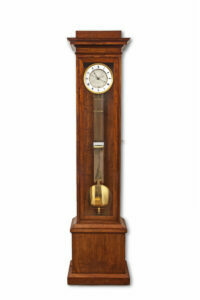 It has quarter-hour striking on six bells with six hammers and an additional bell for the hours. 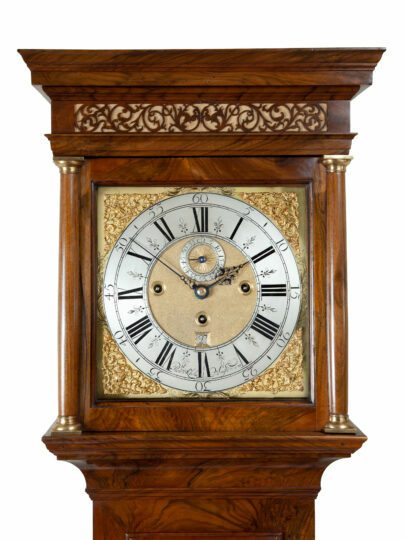 The striking is regulated by an internal count wheel, as well as a quarter-hour disc. 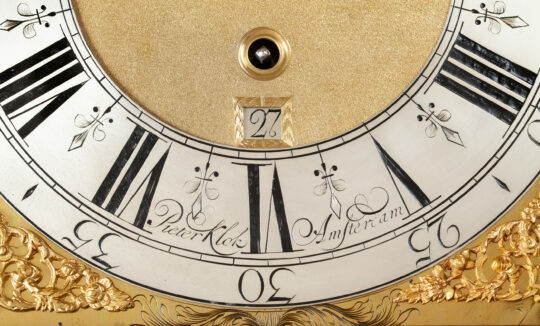 The square brass dial has a silvered chapter ring with Roman hour, half-hour, quarter-hour, seven-and-a-half-minute, five-minute and minute divisions. The matted centre has a date aperture above the VI and a silvered seconds ring below the XII. The three winding holes are situated left and right of, and below the middle at the level of the III and IX. The maker has signed the clock at the bottom of the chapter ring, Pieter Klok Amsterdam. The corners are embellished by four elaborate cast brass spandrels depicting a man’s head with headdress. There are engravings between the spandrels. 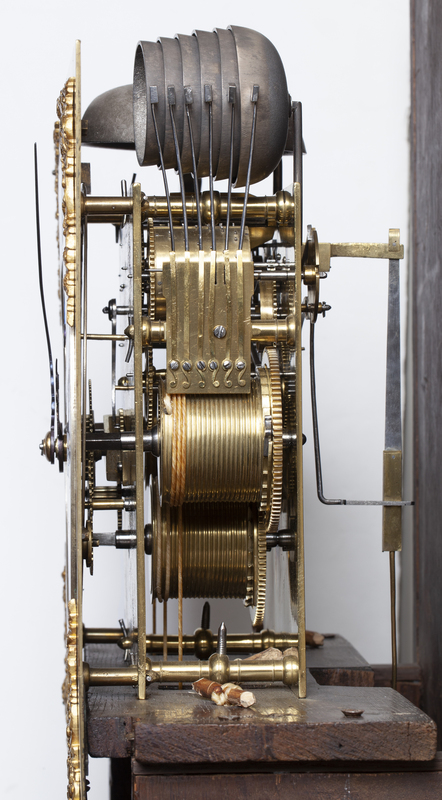 The time is indicated by a fine period pair of pierced blued-steel hands. 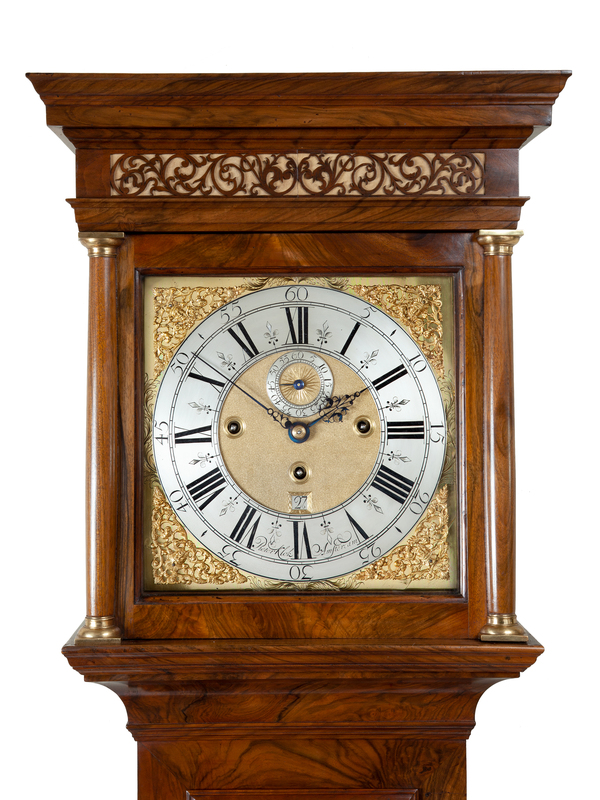 The walnut-veneered oak case has a rectangular trunk door with glazed oval lenticle set in a wooden surround and is framed by mouldings. The hood has mouldings at the top and bottom, and a frieze with silk-backed pierced wooden sound apertures. The glazed hood door is flanked by two brass capped plain pillars, matched by quarter pillars at the back. The square and moulded base rests at the front on two raised bun feet and at the back on two straight feet. J. Zeeman, De Nederlandse staande klok, Zwolle, 1996, p. 469. Pieter Klok was born in Uithoorn in 1665. He founded his business in Amsterdam before 1700. Initially he had his workshop on the Singel. On 27 July 1703 he lived on the Kalverstraat and in that same year married Maria Kramer, who also originated from Uithoorn. 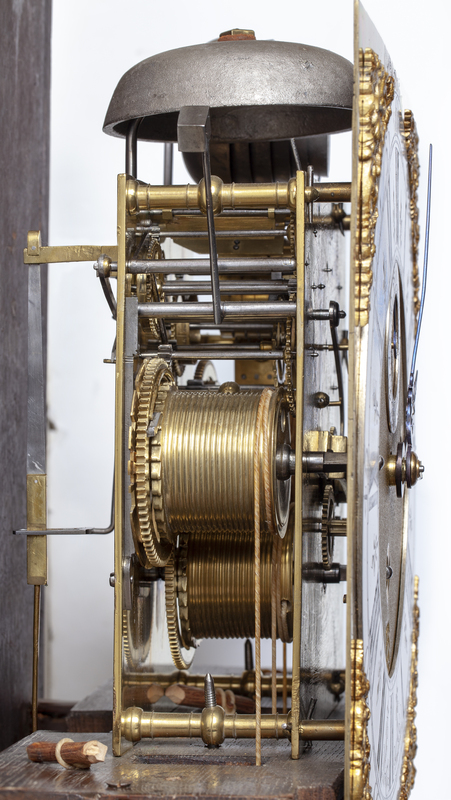 In 1704 he assessed the musical train of a clock by Cornelis van den Bergh and confirmed that it met all requirements. 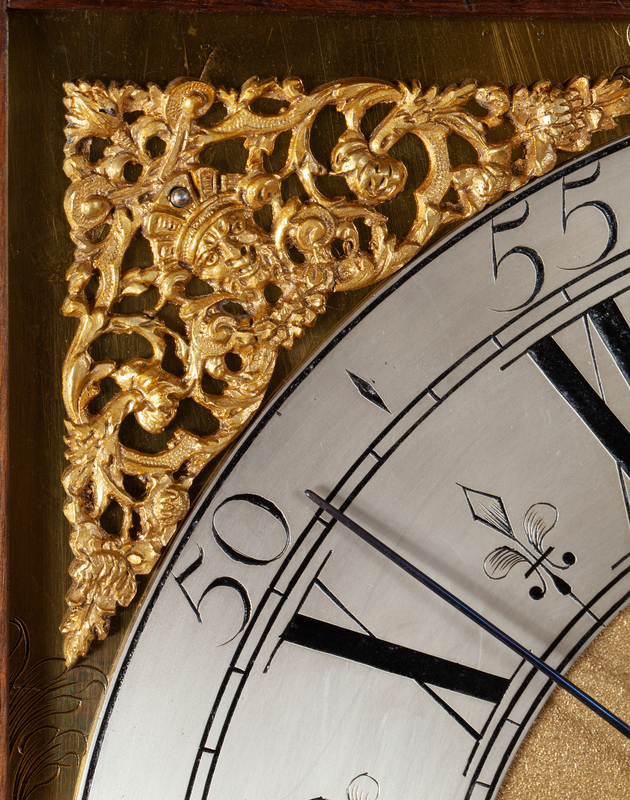 In 1716 the Amsterdam magistrate asked him to set up a list of prominent clockmakers in the city, the so-called third Register of Good Men. Steven Huygens had done the same in 1704 and in 1710. Pieter Klock is mentioned in both lists. Apart from being a clockmaker, he was also a dealer in paintings. From an advertisement of 12 August 1741 it becomes clear that his business was in the Kalverstraat between Osjesweg and Heiligenweg. His son Martinus was also active in the business. In 1742 Pieter Klock lived with his son. He died in Amsterdam in 1744.